Exceptional academic performance is rewarded in the School of Business. Students will receive recognition via the Dean’s list and the President’s list. Students graduating in the top 10 percent of their class are tapped to join Beta Gamma Sigma the international business honor society. Students may also earn School of Business Scholar and School of Business Honors. 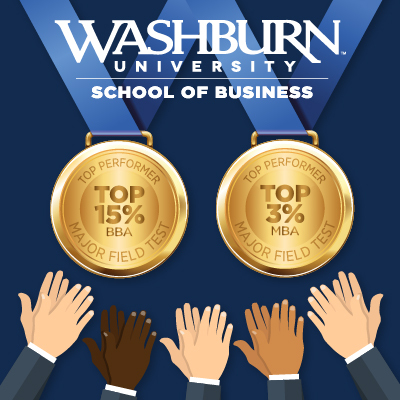 The Washburn University School of Business, as part of its continuous improvement efforts and consistent with the requirements of Washburn University, the Higher Learning Commission of the North Central Association of Colleges and Schools, and the Association for the Advancement of Collegiate Schools of Business (AACSB), administers surveys and tests to its students, graduates, staff and external constituents. For currently enrolled students, the tests and surveys are required as part of coursework or as program and degree graduation requirements separate from coursework, and independently of the catalog under which the student intends to graduate. Tests may be administered during regularly scheduled classes, or at other time separate from class meeting times. The Major Field Test is a degree requirement for all business students and is taken by students enrolled in our capstone business course, BU449 Strategic Management. This test is prepared by Educational Testing Services (ETS). The content of the Major Field Tests reflects the basic knowledge and understanding gained in the core undergraduate curriculum. The tests are two-hour, multiple-choice examinations designed to assess mastery of concepts and principles as well as knowledge expected of students at the conclusion of a major in specific subject areas. They go beyond measurement of factual knowledge, however, because they also evaluate students' ability to analyze and solve problems, understand relationships, and interpret material. For the last several semesters the School mean has been at or above the 80th percentile. We are pleased with these scores as they confirm what we have always believed, that our students are getting a great education from the School of Business! Approximately 560 institutions and more than 68,000 students participate in the administration of the Major Field Test. The Dicus Excellence in Teaching Award is made possible by the generosity of long-time Topekans John C. “Jack” and Betty Dicus. Each year, members of the Dean’s Student Advisory Committee gather nominations from the School of Business student body for this prestigious award. The student committee alone selects the recipient and the award winner is named at the annual School of Business scholarship awards luncheon. Each award winner has demonstrated excellence in teaching and dedication to the mission of the Washburn School of Business. 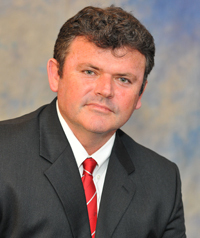 The 2018 recipient of the Dicus Excellence in Teaching Award is Professor David Price.